Azure provides stable and fast ways to connect from your on-premises network to Azure. Methods like Site-to-Site VPN and ExpressRoute are successfully used by customers large and small to run their businesses in Azure. But what happens when performance doesn't meet your expectation or previous experience? This document can help standardize the way you test and baseline your specific environment. This document shows how you can easily and consistently test network latency and bandwidth between two hosts. This document also provides some advice on ways to look at the Azure network and help to isolate problem points. The PowerShell script and tools discussed require two hosts on the network (at either end of the link being tested). One host must be a Windows Server or Desktop, the other can be either Windows or Linux. The approach to troubleshooting, the tools, and methods used are personal preferences. This document describes the approach and tools I often take. Your approach will probably differ, there's nothing wrong with different approaches to problem solving. However, if you don't have an established approach, this document can get you started on the path to building your own methods, tools, and preferences to troubleshooting network issues. Before digging into troubleshooting, let's discuss some common terms and components. This discussion ensures we're thinking about each component in the end-to-end chain that enables connectivity in Azure. Virtual Machine - The server may have multiple NICs, ensure any static routes, default routes, and Operating System settings are sending and receiving traffic the way you think it is. Also, each VM SKU has a bandwidth restriction. If you're using a smaller VM SKU, your traffic is limited by the bandwidth available to the NIC. I usually use a DS5v2 for testing (and then delete once done with testing to save money) to ensure adequate bandwidth at the VM. NIC - Ensure you know the private IP that is assigned to the NIC in question. NIC NSG - There may be specific NSGs applied at the NIC level, ensure the NSG rule-set is appropriate for the traffic you're trying to pass. For example, ensure ports 5201 for iPerf, 3389 for RDP, or 22 for SSH are open to allow test traffic to pass. VNet Subnet - The NIC is assigned to a specific subnet, ensure you know which one and the rules associated with that subnet. Subnet NSG - Just like the NIC, NSGs can be applied at the subnet as well. Ensure the NSG rule-set is appropriate for the traffic you're trying to pass. (for traffic inbound to the NIC the subnet NSG applies first, then the NIC NSG, conversely for traffic outbound from the VM the NIC NSG applies first then the Subnet NSG comes into play). Subnet UDR - User Defined Routes can direct traffic to an intermediate hop (like a firewall or load-balancer). Ensure you know if there is a UDR in place for your traffic and if so where it goes and what that next hop will do to your traffic. (for example, a firewall could pass some traffic and deny other traffic between the same two hosts). Gateway subnet / NSG / UDR - Just like the VM subnet, the gateway subnet can have NSGs and UDRs. Make sure you know if they are there and what effects they have on your traffic. VNet Gateway (ExpressRoute) - Once peering (ExpressRoute) or VPN is enabled, there aren't many settings that can affect how or if traffic routes. If you have multiple ExpressRoute circuits or VPN tunnels connected to the same VNet Gateway, you should be aware of the connection weight settings as this setting affects connection preference and affects the path your traffic takes. Route Filter (Not shown) - A route filter only applies to Microsoft Peering on ExpressRoute, but is critical to check if you're not seeing the routes you expect on Microsoft Peering. At this point, you're on the WAN portion of the link. This routing domain can be your service provider, your corporate WAN, or the Internet. Many hops, technologies, and companies involved with these links can make it somewhat difficult to troubleshoot. Often, you work to rule out both Azure and your Corporate Networks first before jumping into this collection of companies and hops. In the preceding diagram, on the far left is your corporate network. Depending on the size of your company, this routing domain can be a few network devices between you and the WAN or multiple layers of devices in a campus/enterprise network. Given the complexities of these three different high-level network environments, it's often optimal to start at the edges and try to show where performance is good, and where it degrades. This approach can help identify the problem routing domain of the three and then focus your troubleshooting on that specific environment. Most network issues can be analyzed and isolated using basic tools like ping and traceroute. It's rare that you need to go as deep as a packet analysis like Wireshark. To help with troubleshooting, the Azure Connectivity Toolkit (AzureCT) was developed to put some of these tools in an easy package. For performance testing, I like to use iPerf and PSPing. iPerf is a commonly used tool and runs on most operating systems. iPerf is good for basic performances tests and is fairly easy to use. PSPing is a ping tool developed by SysInternals. PSPing is an easy way to perform ICMP and TCP pings in one also easy to use command. Both of these tools are lightweight and are "installed" simply by coping the files to a directory on the host. I've wrapped all of these tools and methods into a PowerShell module (AzureCT) that you can install and use. The AzureCT PowerShell module has two components Availability Testing and Performance Testing. This document is only concerned with Performance testing, so lets focus on the two Link Performance commands in this PowerShell module. There are three basic steps to use this toolkit for Performance testing. 1) Install the PowerShell module, 2) Install the supporting applications iPerf and PSPing 3) Run the performance test. This command downloads the PowerShell module and installs it locally. This AzureCT command installs iPerf and PSPing in a new directory "C:\ACTTools", it also opens the Windows Firewall ports to allow ICMP and port 5201 (iPerf) traffic. First, on the remote host you must install and run iPerf in server mode. Also ensure the remote host is listening on either 3389 (RDP for Windows) or 22 (SSH for Linux) and allowing traffic on port 5201 for iPerf. If the remote host is windows, install the AzureCT and run the Install-LinkPerformance command to set up iPerf and the firewall rules needed to start iPerf in server mode successfully. This command runs a series of concurrent load and latency tests to help estimate the bandwidth capacity and latency of your network link. The detailed results of all the iPerf and PSPing tests are in individual text files in the AzureCT tools directory at "C:\ACTTools." If the performance test is not giving you expected results, figuring out why should be a progressive step-by-step process. Given the number of components in the path, a systematic approach generally provides a faster path to resolution than jumping around and potentially needlessly doing the same testing multiple times. The scenario here is a performance issue, not a connectivity issue. The steps would be different if traffic wasn't passing at all. First, challenge your assumptions. Is your expectation reasonable? For instance, if you have a 1-Gbps ExpressRoute circuit and 100 ms of latency it's unreasonable to expect the full 1 Gbps of traffic given the performance characteristics of TCP over high latency links. See the References section for more on performance assumptions. Next, I recommend starting at the edges between routing domains and try to isolate the problem to a single major routing domain; the Corporate Network, the WAN, or the Azure Network. People often blame the "black box" in the path, while blaming the black box is easy to do, it may significantly delay resolution especially if the problem is actually in an area that you have the ability to make changes. Make sure you do your due diligence before handing off to your service provider or ISP. Once you've identified the major routing domain that appears to contain the problem, you should create a diagram of the area in question. Either on a whiteboard, notepad, or Visio as a diagram provides a concrete "battle map" to allow a methodical approach to further isolate the problem. You can plan testing points, and update the map as you clear areas or dig deeper as the testing progresses. Now that you have a diagram, start to divide the network into segments and narrow the problem down. Find out where it works and where it doesn't. Keep moving your testing points to isolate down to the offending component. Also, don't forget to look at other layers of the OSI model. It's easy to focus on the network and layers 1 - 3 (Physical, Data, and Network layers) but the problems can also be up at Layer 7 in the application layer. Keep an open mind and verify assumptions. If you're not sure where the edge of the cloud actually is, isolating the Azure components can be a challenge. When ExpressRoute is used, the edge is a network component called the Microsoft Enterprise Edge (MSEE). When using ExpressRoute, the MSEE is the first point of contact into Microsoft's network, and the last hop leaving the Microsoft network. When you create a connection object between your VNet gateway and the ExpressRoute circuit, you're actually making a connection to the MSEE. Recognizing the MSEE as the first or last hop (depending on which direction you're going) is crucial to isolating Azure Network problems to either prove the issue is in Azure or further downstream in the WAN or the Corporate Network. Notice that the MSEE isn't in the Azure cloud. ExpressRoute is actually at the edge of the Microsoft network not actually in Azure. Once you're connected with ExpressRoute to an MSEE, you're connected to Microsoft's network, from there you can then go to any of the cloud services, like Office 365 (with Microsoft Peering) or Azure (with Private and/or Microsoft Peering). Run the Get-LinkPerformance test between VM1 and VM2. This test provides insight to if the problem is local or not. If this test produces acceptable latency and bandwidth results, you can mark the local VNet network as good. Assuming the local VNet traffic is good, run the Get-LinkPerformance test between VM1 and VM3. This test exercises the connection through the Microsoft network down to the MSEE and back into Azure. If this test produces acceptable latency and bandwidth results, you can mark the Azure network as good. If Azure is ruled out, you can perform a similar sequence of tests on your Corporate Network. If that also tests well, it's time to work with your service provider or ISP to diagnose your WAN connection. Example: Run this test between two branch offices, or between your desk and a data center server. Depending on what you're testing, find endpoints (servers, PCs, etc.) that can exercise that path. It's critical that for each test you mark the time of day you run the test and record the results in a common location (I like OneNote or Excel). Each test run should have identical output so you can compare the resultant data across test runs and not have "holes" in the data. Consistency across multiple tests is the primary reason I use the AzureCT for troubleshooting. The magic isn't in the exact load scenarios I run, but instead the magic is the fact that I get a consistent test and data output from each and every test. Recording the time and having consistent data every single time is especially helpful if you later find that the issue is sporadic. Be diligent with your data collection up front and you'll avoid hours of retesting the same scenarios (I learned this hard way many years ago). The problem is isolated, now what? The more you can isolate the problem the easier it is to fix, however often you reach the point where you can't go deeper or further with your troubleshooting. Example: you see the link across your service provider taking hops through Europe, but your expected path is all in Asia. This point is when you should reach out for help. Who you ask is dependent on the routing domain you isolated the issue to, or even better if you are able to narrow it down to a specific component. For corporate network issues, your internal IT department or service provider supporting your network (which may be the hardware manufacturer) may be able to help with device configuration or hardware repair. For the WAN, sharing your testing results with your Service Provider or ISP may help get them started and avoid covering some of the same ground you've tested already. However, don't be offended if they want to verify your results themselves. "Trust but verify" is a good motto when troubleshooting based on other people's reported results. With Azure, once you isolate the issue in as much detail as you're able, it's time to review the Azure Network Documentation and then if still needed open a support ticket. Geographic latency (miles or kilometers) between the end points you're testing is by far the largest component of latency. While there is equipment latency (physical and virtual components, number of hops, etc.) involved, geography has proven to be the largest component of overall latency when dealing with WAN connections. It's also important to note that the distance is the distance of the fiber run not the straight-line or road map distance. This distance is incredibly hard to get with any accuracy. As a result, I generally use a city distance calculator on the internet and know that this method is a grossly inaccurate measure, but is enough to set a general expectation. I've got an ExpressRoute setup in Seattle, Washington in the USA. 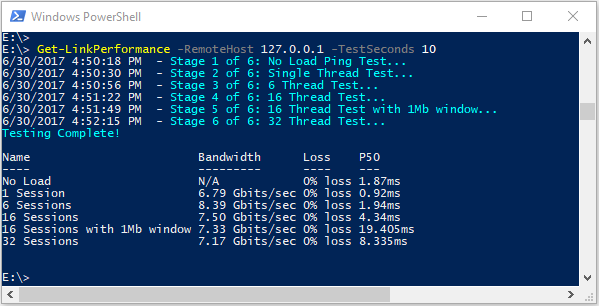 The following table shows the latency and bandwidth I saw testing to various Azure locations. I've estimated the geographic distance between each end of the test. A physical server running Windows Server 2016 with a 10 Gbps NIC, connected to an ExpressRoute circuit. A 10Gbps Premium ExpressRoute circuit in the location identified with Private Peering enabled. 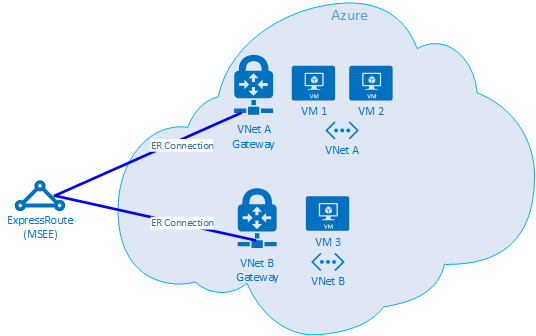 An Azure VNet with an UltraPerformance gateway in the specified region. A DS5v2 VM running Windows Server 2016 on the VNet. The VM was non-domain joined, built from the default Azure image (no optimization or customization) with AzureCT installed. The data flow for each test had the load flowing from the on-premises physical server (iPerf client in Seattle) up to the Azure VM (iPerf server in the listed Azure region). The "Latency" column data is from the No Load test (a TCP latency test without iPerf running). The "Max Bandwidth" column data is from the 16 TCP flow load test with a 1-Mb window size. These numbers are for general reference only. Many factors affect latency, and while these values are generally consistent over time, conditions within Azure or the Service Providers network can send traffic via different paths at any time, thus latency and bandwidth can be affected. Generally, the effects of these changes don't result in significant differences. * The latency to Brazil is a good example where the straight-line distance significantly differs from the fiber run distance. I would expect that the latency would be in the neighborhood of 160 ms, but is actually 189 ms. This difference against my expectation could indicate a network issue somewhere, but most likely that the fiber run does not go to Brazil in a straight line and has an extra 1,000 km or so of travel to get to Brazil from Seattle.